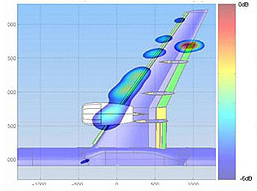 Noise reduction technologies represent one of the biggest demands on today’s aircraft development. Aerodynamic noise normally comes from several locations on an airframe. Although measuring airframe noise with a single microphone makes it possible to evaluate the overall noise level, this approach does not allow researchers to pinpoint exact locations of noise sources or the amount of noise emitted from each of them. Therefore, JAXA developed a technology that uses a large number of microphones to simultaneously identify noise source locations and sound pressure levels based on how long it takes a given sound wave to propagate from its noise source to each microphone in the array. JAXA has already developed technologies that can identify the noise source locations in frequency bands up to 80 kHz (the maximum frequency for 1/8 scale models to predict noise emitted by actual aircraft). By developing noise level correction technology which does not depend on the flow of air, we have improved the quantitative precision of measurement when no wind exists. By using image-processing methods to create high-resolution images of sound pressure distributions and performing simultaneous acoustic and optical measurements, JAXA will develop technologies for identifying the aerodynamic phenomena that can cause noise. 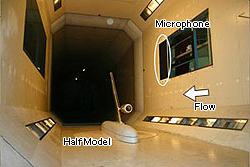 Furthermore, we will develop technology for simultaneous high-accuracy evaluation of aerodynamic phenomena and noise in wind tunnel testing which uses anechoic measurement components with Kevlar walls.